So, as I talked about the other day, this past week has been rough! I worked extra shifts at work and therefore screwed up my sleep schedule. All total I logged FOUR days that I didn’t work out. Yesterday I was proud of myself that I didn’t make that five days. I did my bike ride, 16.8 miles total in an hour and a half. Felt great. And to think, I was actually considering skipping it! Crazy! 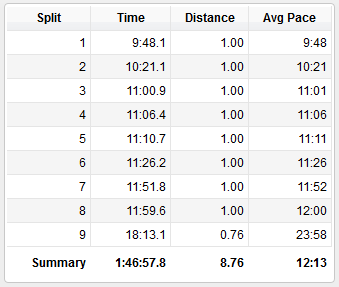 Today, I challenged myself to attempt an 8 mile run. I used mapmyrun.com to come up with an 8 mile course and then off I went. I don’t know if I just didn’t turn around when I should have or if mapmyrun was off in their measurement because when I got done with the 8 miles (yes! I actually ran 8 miles!!! 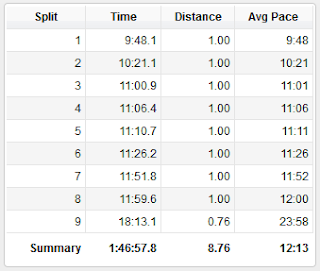 ), there was still ¾ of a mile left to go. I walked that. So, yea, I ran EIGHT miles today! I’m not even going to say it was easy because it wasn’t. It had been 5 days since I had gone on a run since I skipped Friday’s run I favor of catching up on sleep. Since I’ve started running outside, I haven’t gone more than 2 days without running. I believe that had a big part in why running wasn’t easy for me today. I was slowing down earlier than I should have. By mile 3 I was already at an 11 minute/mile pace. Eep! I finished the 8 miles in an hour and 29 minutes. With the walk at the end, I was done in 1 hour and 47 minutes and my Garmin said I burned over 1700 calories! Holy wow! I treated myself to a healthy lunch out at Subway. I got the turkey and black forest ham 6 inch on 9 grain honey oat. So tasty. I did have them put just one swipe of light mayo (about a tbsp) on my sandwich. And I got the provolone cheese cuz it’s the lowest in calories. Since I did so well with my run today, I got 2 cookies instead of some low fat kettle cooked chips. I started my day later so I figured that I would be eating less today so then I could “afford” to have 2 cookies. I’m back to tracking what I’m eating, so I’m back on track with everything again. I know I can keep this up. I’m thinking next weekend I’m going to go and buy me a new swimsuit. I want one of the one piece suits that has the sides cut out and the strip of fabric that connects the top with the bottom that covers the front middle of your torso.